Villagers in the Mu Lah townships area are concerned that the Italian-Thai Development Company are soon to finish the last phase of the soil survey for the building of the Tenasserim hydro-power dam in southern Burma. Pdoh Saw Eh Htoo, chairman of the Karen National Union’s (KNU) at Ler Mu Lah townships told Karen News. Pdoh Saw Eh Htoo said the survey area is under the control of the KNU’s Ler Mu Lah Township office. The Italian-Thai Development Company and Windfall Energy Services of Singapore signed a memorandum of understanding with the former Burmese military government on October 9, 2008 to build the 600-megawatt Tenasserim hydroelectric project on the Tenasserim River. 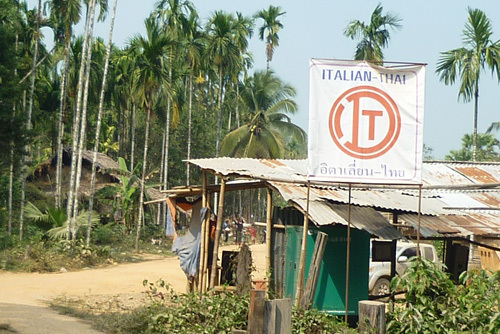 The Italian-Thai Development Company stopped their survey last year after the KNU demanded the company carryout environmental impact assessments. From the end of 2008 until May 2011, Italian-Thai surveyors and Burma Army soldiers carried out a series of surveys on the Tenasserim River. Pdoh Saw Eh Htoo said that the local people are concerned. KNU’s Ler Mu Lah township officials are concerned that if the dam is built in the area, at least12 villages will be flooded and many more affected.